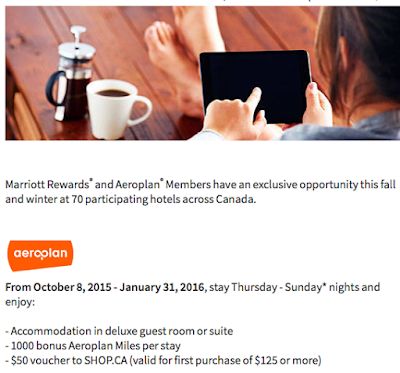 We tend to see an Aeroplan Marriott offer for stays in Canada several times per year and in most cases it is just for bonus miles. This time it is slightly different as they are sweetening the pot with a $50 SHOP.CA voucher with those stays! If this offer doesn't suit your needs be sure to visit Rewards Canada's Aeroplan Bonus Miles page for many more opportunities! 30,000 Bonus Rewards Points when you apply for and receive the Premier card. Points are awarded after your first purchase.